This is your next must-have knife. Of course you'll like the size and how it feels in your hand. You'll appreciate the useful modified clip-point blade. But it's the little flourishes that take the Flourish over the top. The large 3.5-inch blade has a top swedge and a hollow grind. But there's also a machined recess in the upper part of the blade to add visual interest. This is your next must-have knife. Of course you&apos;ll like the size and how it feels in your hand. You&apos;ll appreciate the useful modified clip-point blade. But it&apos;s the little flourishes that take the Flourish over the top. The large 3.5-inch blade has a top swedge and a hollow grind. But there&apos;s also a machined recess in the upper part of the blade to add visual interest. Combined, the swedge and the recess also slightly lighten the weight of this larger knife. But Kershaw isn&apos;t not done yet. 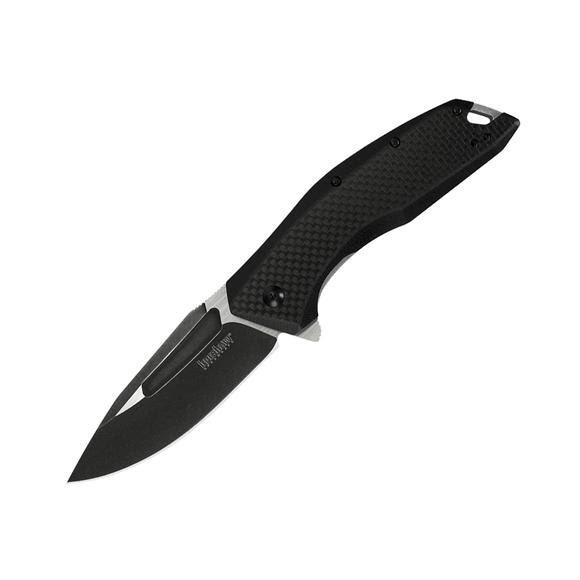 Next, Kershaw BlackWashes the blade grinds giving the Flourish an attractive finish that also hides scratches. Finally, we put a satin finish on the blade flats. The result is a two-tone blade with an abundance of style and cutting performance. Access the blade with Kershaw&apos;s quick and snappy SpeedSafe assisted opening. The handle offers additional details. The scales, both front and back are machined G-10 with a carbon fiber overlay that gives the Flourish a classy, even high-tech look. Chamfering on the handle ensures that it fits securely and comfortably in the hand. A sturdy liner lock secures the blade open during use. There&apos;s a built in lanyard tie-off that&apos;s actually large enough to get your paracord through. The final flourish on the Flourish is a reversible pocketclip for left- or right-handed carry.